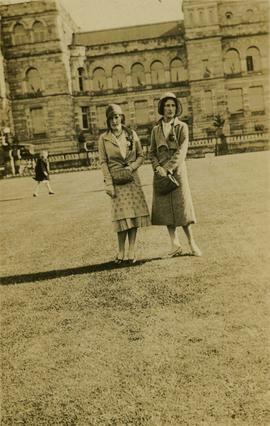 Photograph of two unidentified women posing in front of a large building, which is identified, though not confirmed, to be Britannia High School in Vancouver, British Columbia. 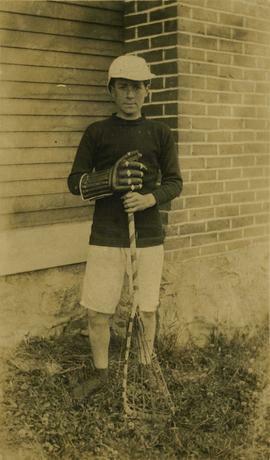 Photograph of an unidentified boy wearing one lacrosse glove and holding a lacrosse stick. Photograph of a group of unidentified people, possibly including Helen Kagnoff (right), standing in front of a sign. It appears that they are in a forest. Photograph of a large group of unidentified people laying down on the grass, possibly including Harry Seidelman and/or his siblings. Wine Card of the Canadian Australasian Royal Mail S.S. Co., Ltd.